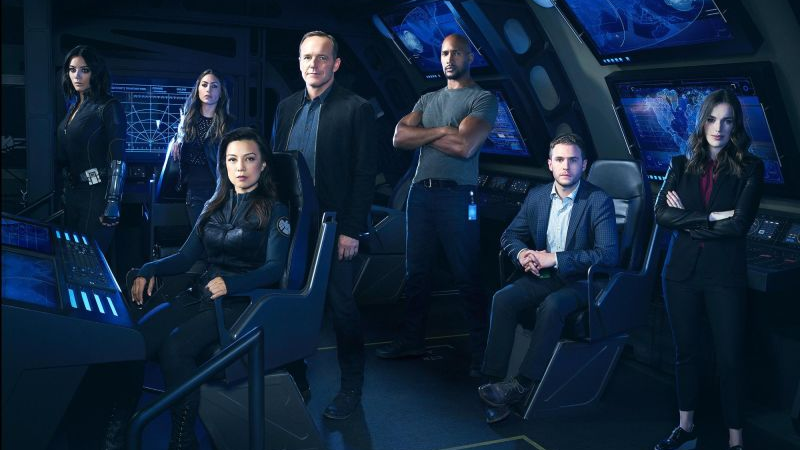 After ending a spectacular season four—which included Ghost Rider, Life Model Decoys, and the Framework—Agents of SHIELD will be back for a two-hour premiere on December 1. The season five premiere began with an extended bit with a bald man in the classic man-in-black suit getting ready for his day—which included taking off his human skin while he showered—and then meeting a group of men with guns and armor to surround the diner where our team was last seen. We see a frozen Coulson and then a block of something white dissolves. Then, Coulson comes to on a spaceship where a window has just blown out. On the ship are two men, one of whom is almost immediately eaten by the space “roaches” that have infested the ship. They, apparently, are just a bump in the road and not the true threat. The survivor tells Coulson that he’s there to save them, and that he’s a “true believer” in him. That’s when Mack punches him in the head and knocks him out. Simmons and Yo-yo have been transported to a different part of the ship where there are bodies that have been drained of fluid. They run into Mack and Coulson, who are hauling the lone survivor they’ve encountered between them. (When Simmons finds out they’re in space, she says exasperated “not again.”) Coulson goes through the unconscious man’s pockets and pulls out something that looks like a cross between a key and flashdrive and gives it to Simmons. When the guy wakes up, he tells the team that he knows their names and all about them—and that he’s sorry Fitz isn’t there, but he’s thinking of Simmons—and that they’re there to save humanity. He says all of this will makes sense when he shows them something. He’s killed by a roach before he can answer. On the run from the roach, they’re saved by Quake, who uses her powers to blow it up. While all of this has been going on, May materialized on the ship with a pipe/railing/bit of metal through her leg. She’s spending every cut to her trying to pry it out of the where it’s secured so she can move. We also see a guy with a helmet and dark red jacket (it evokes the Star-Lord look, but is clearly very different) get on the ship. Just as May gets out of the wall, he comes into the room she’s in, dragging a body that cuts a bit of technology out of arm of and loots. He slams May against the wall by the neck and says he’s been looking for her.